EMORY (US) — Life on the Nile 1,500 years ago may have contributed to the spread of a plague that is one of the most prevalent parasitic diseases today, infecting 200 million people. An analysis of mummies from Nubia, a former kingdom located in present-day Sudan, provides details for the first time about the prevalence of the plague of schistosomiasis, associated with modern-day irrigation techniques, and how human alteration of the environment during that era may have contributed to its spread. “Often in the case of prehistoric populations, we tend to assume that they were at the mercy of the environment, and that their circumstances were a given,” says Amber Campbell Hibbs., who recently received her PhD in anthropology from Emory University. The study is published in the American Journal of Physical Anthropology. Schistosomiasis is caused by parasitic worms that live in certain types of freshwater snails, emerge to contaminate fresh water, and then infect humans whose skin comes in contact with the water. This latest study tested desiccated tissue samples from two Nubian populations for S. mansoni. The Kulubnarti population lived about 1,200 years ago, during an era when Nile flooding was at its highest average known height, and archaeological evidence for irrigation is lacking. The Wadi Halfa population lived further south along the Nile, about 1,500 years ago, when the average heights of the river were lower. Archeological evidence indicates that the Wadi Halfa used canal irrigation to sustain multiple crops. The analysis of tissue samples showed that 25 percent of the Wali Halfi population in the study were infected with S. mansoni, while only 9 percent of the Kulubnarti were infected. “Previously, it was generally assumed that in ancient populations schistosomiasis was primarily caused by S. haematobium, and that S. mansoni didn’t become prevalent until Europeans appeared on the scene and introduced intensive irrigation schemes,” Campbell Hibbs says. 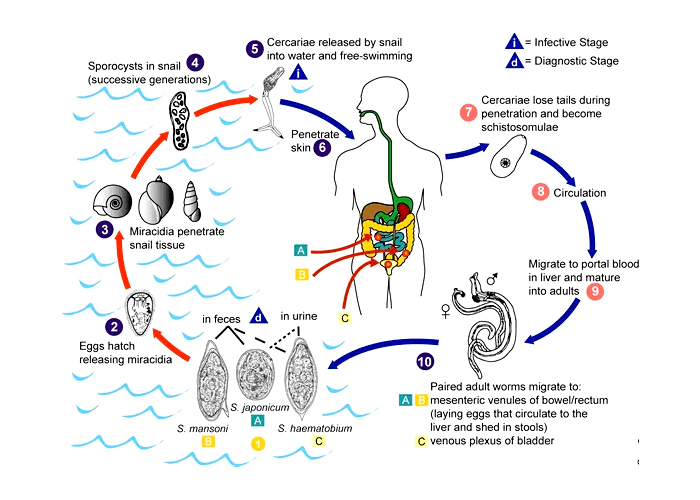 Center for Disease Control graphic shows the lifecycle of schistosomiasis. Bioarcheologist and co-author George Armelagos has been studying ancient Nubian populations for more than three decades. Through extensive analysis, he has shown that nearly 2,000 years ago the Nubians were regularly consuming tetracycline, most likely in their beer, at levels high enough to show they were deliberately brewing the antibiotic effects. “The Nubians were probably in healthier shape than many other populations of their time, due to the dry climate, which would reduce their bacterial load, and because they were getting tetracycline,” Armelagos says.